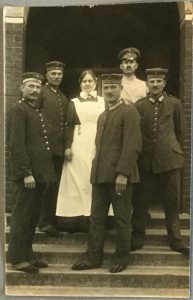 In this month’s edition, Louise, Archivist in Lothian Health Services Archive (LHSA), finds a different view of the First World War…. 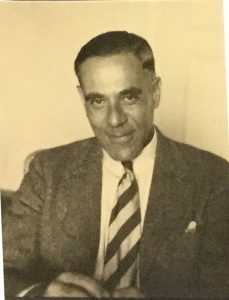 Ernst Levin (1887 – 1975) was a German-born neurologist who first came to Edinburgh in 1933 to work with neurosurgeon Norman Dott in the Royal Infirmary of Edinburgh. 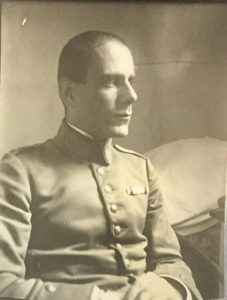 Since Levin was Jewish, the Nazi rise to power meant that he could no longer work in his then-home of Munich, where he had just received a Chair in neurology at the city’s University. 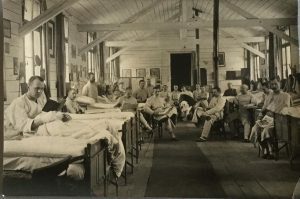 We knew about Levin’s medical work in hospitals across the city and for the German consulate in Scotland through his medical papers, donated to LHSA in the 1970s. 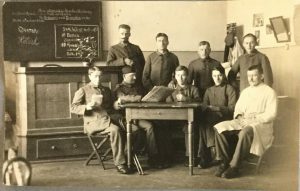 However, although we had a record of Ernst’s career, we knew little of his time in Germany or his experiences as an émigré, leaving a lot of blanks when interested researchers asked to know more about the man behind the archive. 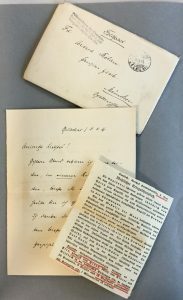 In 2015, I was given the opportunity to acquire Levin’s personal papers for LHSA – letters, photographs and mementos that added to the clinical profile we already held. 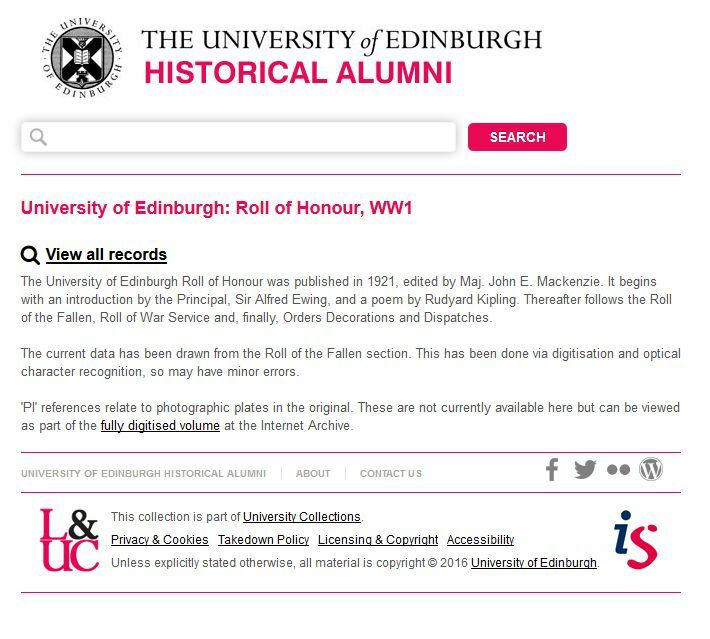 This was a first for us in combining private and career records to give a more complete picture of a prominent personality in Edinburgh’s medical life. Through this new collection, I learnt that Levin served during the First World War and later, along with his wife Anicuta Belau, had a wide circle of friends in the artistic movements of the decadent Weimar Republic. With the Nazi rise to power, Levin came to Edinburgh, subsequently joined by Anicuta and their daughter, Anna. 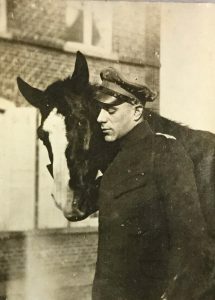 Levin (like many other European exiles) was interred (in the Isle of Man) during the Second World War – but still returned to live the rest of his life in Edinburgh. 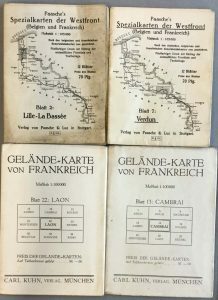 And it is this language barrier that, at the moment, we are looking for ways to overcome, from involving academics to better understand the content of Levin’s archive to tracing the content of the collection through methods that do not involve deciphering the older-style German script in which manyof the letters are written. 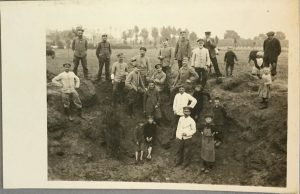 However, the visual clues I can decipher have already given me a privileged view behind the German lines. 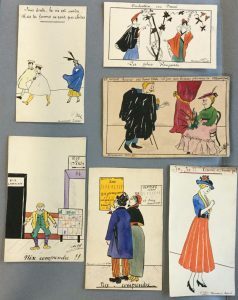 All images from LHSA accession, Acc15/001. 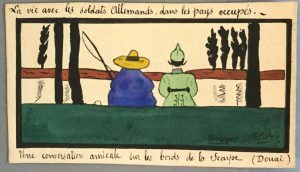 In the book collections curated by the CRC is the work entitled La Belgique monumentale: 100 planches en phototypie by Karel Sluyterman (1863-1931), the Dutch architect, designer and illustrator, and Jules Jacques van Ysendyck (1836-1901) the Belgian architect and propagandist for the neo-Flemish Renaissance style. 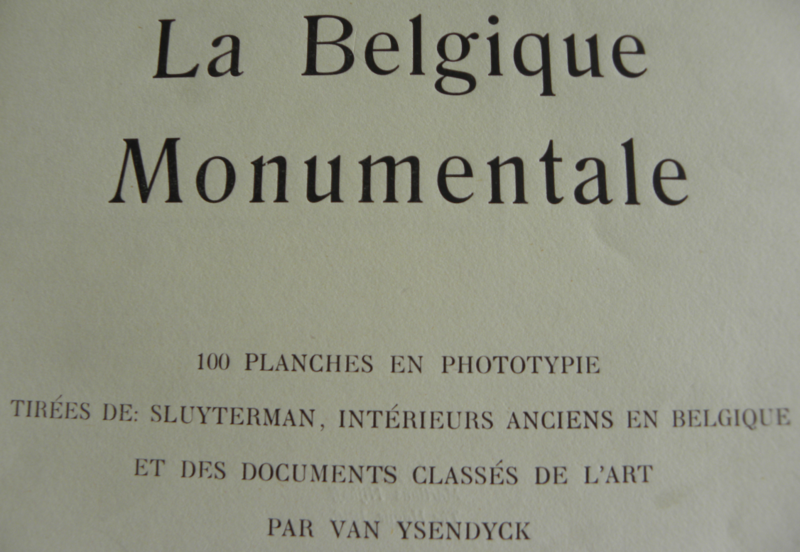 Title-page, ‘La Belgique monumentale’, by the architects Karel Sluyterman and Jules Jacques van Ysendyck, published by Martinus Nijhoff, 1915. 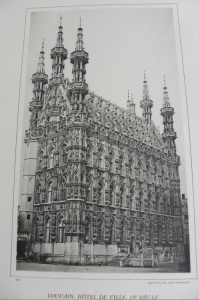 The work published in 1915 in the neutral Netherlands by Martinus Nijhoff – a prestigious publishing house in The Hague (La Haye) – contains dozens of collotype prints (a salts based photographic process) showing gems of Belgian architecture. 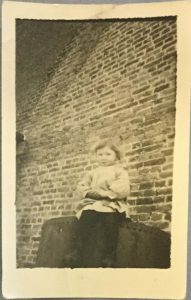 A foreword to the collection of prints states that: ‘As Belgium suffers the devastating horrors of war, it seemed appropriate to circulate images of some Belgian monuments already irreparably damaged and destroyed, and those which are threatened with destruction’. 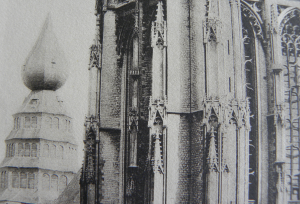 The 15th century Church of Notre Dame in Anvers (Antwerpen), Belgium… its tower and spire. 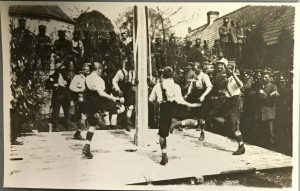 It goes on in very high-flown style: ‘In a very small space, Belgium offers an unparalleled accumulation of ancient cities and monuments, all standing witness to past greatness, offering the evidence of, and paying tribute to, the hard work always known in the country, and showing opulence in the worst distress’. 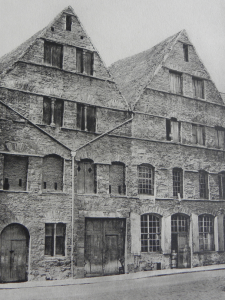 Old buildings in Tournai (Doornik), Belgium. 12th century Romanesque houses (Maisons Romanes). 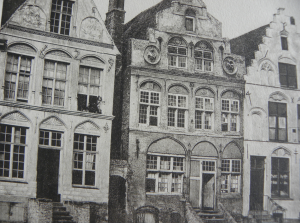 The plates listed include important buildings in the towns and cities of Aerschot (Aarschot), Anvers (Antwerpen), Courtrai (Kortrijk), Dinant, Dixmude (Diksmuide), Louvain (Leuven), Malines (Mechelen), Tournai (Doornik), and Ypres (Ieper). 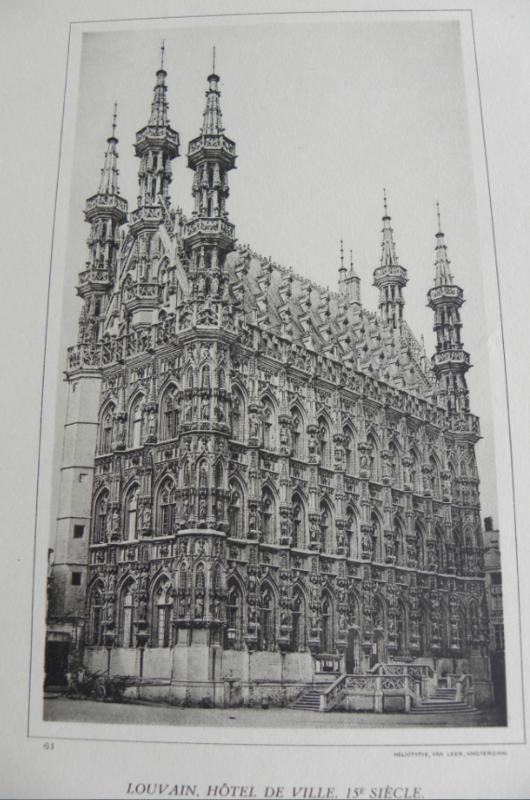 15th century Town Hall, Louvain (Leuven), Belgium. 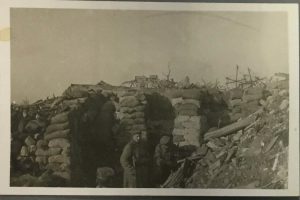 Some of these towns and cities escaped major damage but others suffered catastrophic destruction inflicted by massive bombardment by both sides in the Great War. 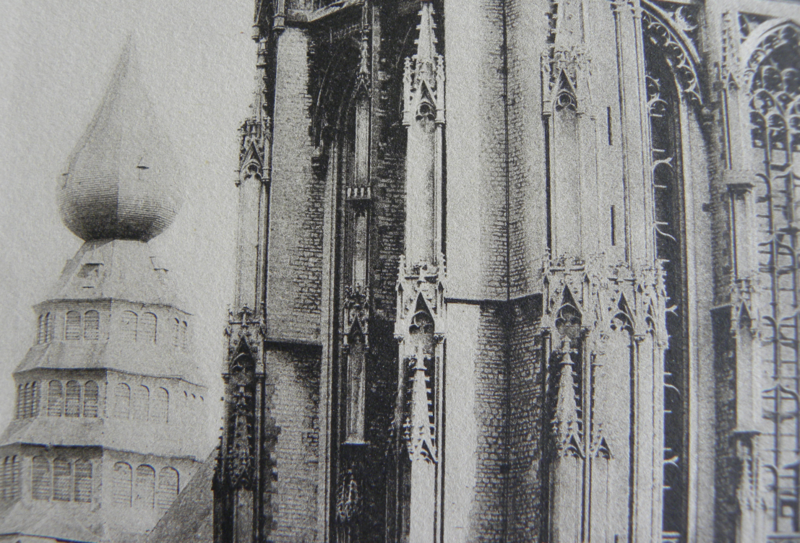 In 1914 the University in Louvain (Leuven) was destroyed. This was the 14th century University Library. 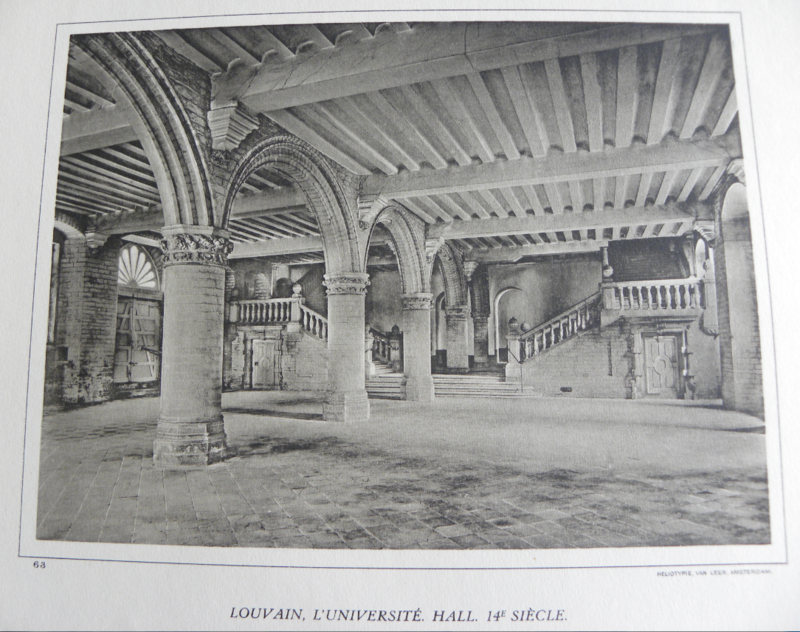 In Louvain, for example, on the 25 August 1914, the University Library was destroyed using petrol and incendiary devices. 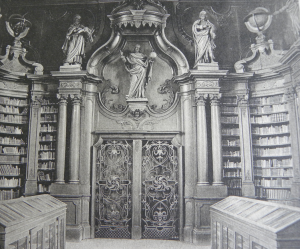 Some 230,000 volumes were lost in the destruction, including Gothic and Renaissance manuscripts, a collection of 750 medieval manuscripts, and more than 1,000 incunabula (books printed before 1501). 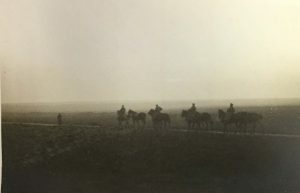 The city lost one fifth of its buildings during the War. 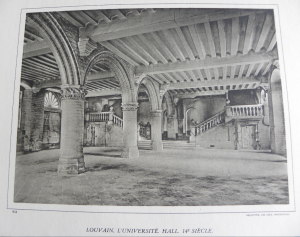 In 1914 the University in Louvain (Leuven) was destroyed. 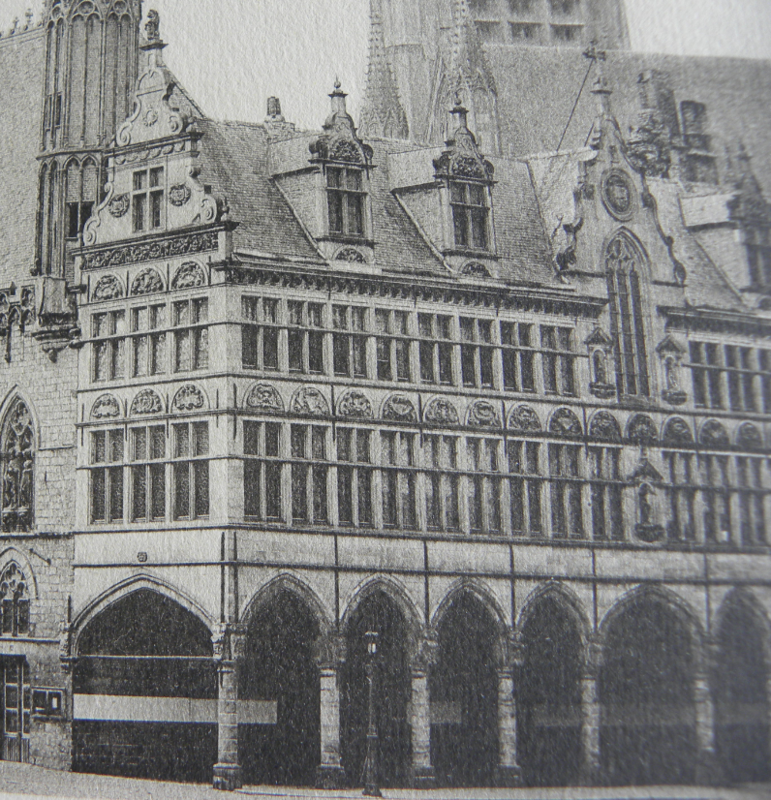 This was the original 14th century Hall. In Ypres too, massive destruction was suffered, with the 13th century Cloth Hall – Lakenhalle – being reduced to rubble. 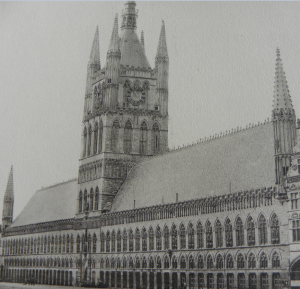 The Cloth Hall (Lakenhalle) in Ypres (Ieper), Belgium, which during the course of the War was reduced to rubble. Reconstructed after the conflict, the original building was constructed between 1200 and 1304. 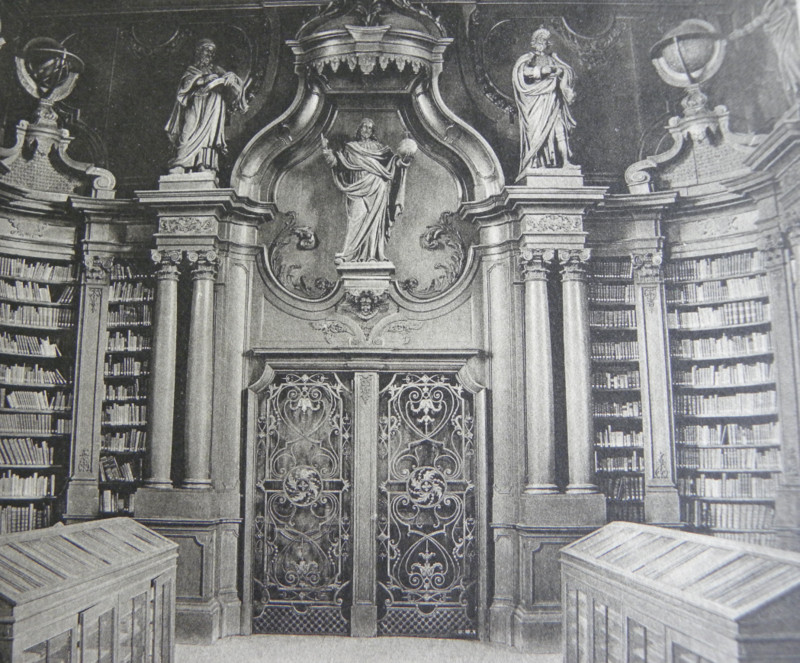 A label on the inside of the front cover of the portfolio of prints reads: ‘From the library of the late Sir Robert Lorimer. Presented by his Family February 1934’. 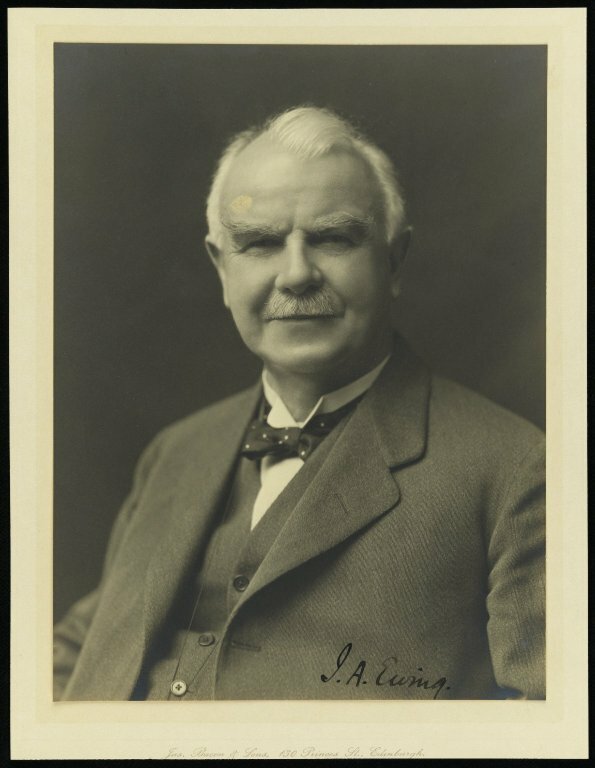 Lorimer was a prolific Scottish architect and furniture designer noted for his sensitive restorations of historic houses and castles, for new work in Scots Baronial and Gothic Revival styles, and for promotion of the Arts and Crafts movement. 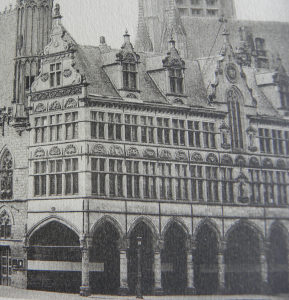 This new addition to the Cloth Hall, called Nieuwerck, dated from the 17th century. 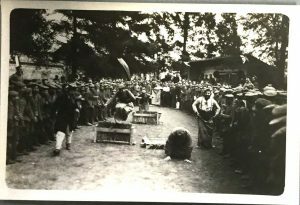 This too was reconstructed during the 1920s. 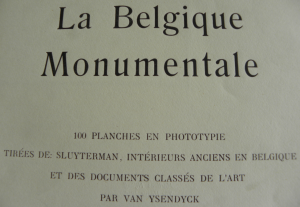 La Belgique monumentale: 100 planches en phototypie can be accessed by contacting the CRC and quoting shelfmark: RECA.FF.116. Merchants Houses in Ypres (Ieper), Belgium, originally dating from 16th-17th centuries.